Weather houses are probably the most enchanting type of weather station that displays the weather. Rain or drought? The question is answered by the popular weather cabinets with their integrated moisture meters. The inner strand of gut strings reacts to changes in humidity, so that the figures move on the turntable: In good weather, the woman in traditional Black Forest costume appears in the rain her male companion with umbrella. 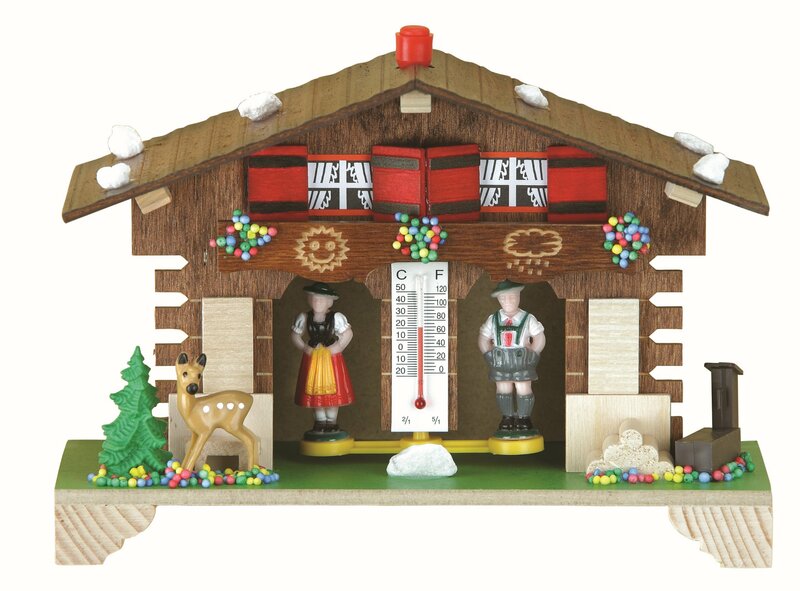 Of course, our weather house is 100% "made in Germany" - more precisely: 100% made in the Black Forest. This is traditional craftsmanship, lovingly staged according to historical models. Of course made of wood and handpainted. In the middle between the figures a thermometer is attached. The weather house is best hung in an air-rich place. Height 14cm. Lovingly finished Black Forest Chalet.